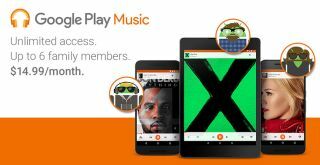 Google launches family plan for Play Music streaming service | What Hi-Fi? Google announced in September it would be introducing a family plan and the new subscription option is set to go live in several countries in “the coming days”. Google’s family plan will allow you and up to five additional family members unlimited access to the Play Music streaming service's 35 million songs. UK pricing has yet to be announced, but given it costs $14.99/month in the US, we're pretty confident it will be £14.99/month in the UK. Each user will be able to stream simultaneously from their own account and also have their own custom playlists. Songs can be downloaded for offline listening and Google will also provide a curated radio station based on your listening habits. Google is also throwing in full access to its YouTube Red service in the US, which provides unlimited access to ad-free YouTube videos. You can sign up for a family plan on Android devices in the coming days in the UK, US, Canada, Australia, France and Germany. After signing up through an Android device, you’ll be able to listen on iOS devices and the web as well. Apple Music offers a similar subscription plan, allowing up to six family members unlimited access to its service for £14.99/month, while Spotify's family plan costs from £15/month for two users, rising incrementally as you add more users.